Last year I had what passes for an epiphany. I was exploring a really fantastic alpine valley on the far side of the Continental Divide, off-trail, in a place where probably fewer than a dozen people visit all year (if that). There were lots of interesting spots to explore, but I was ten miles and 2000 vertical feet of climbing from the car and worried about getting back over the Divide before afternoon lightning storms threatened. Plus, the area I was in was really gorgeous and it would be really nice to be able to sit for a few hours and contemplate this peaceful, awesome place rather than just keep running with occasional five-minute breaks for snacks. The epiphany was this: if I could find a way to spend the night on my runs, I’d be able to thoroughly explore these amazing, remote places. How much gear would I need to bring to overnight in something like this? 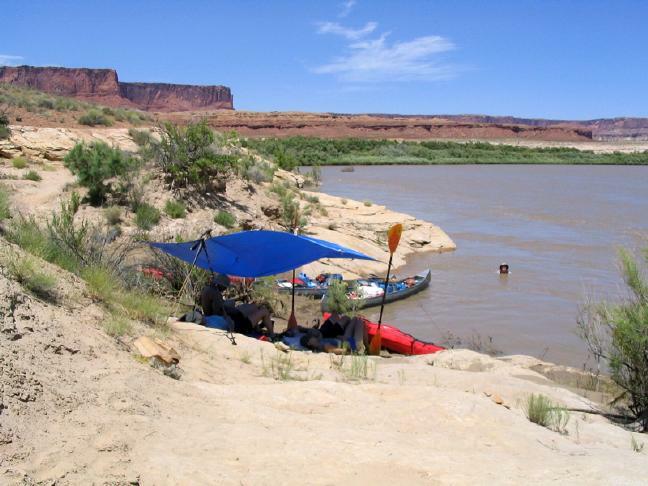 Ultralight backpacking is a fringe but pretty well-established offshoot of regular outdoors pursuits. 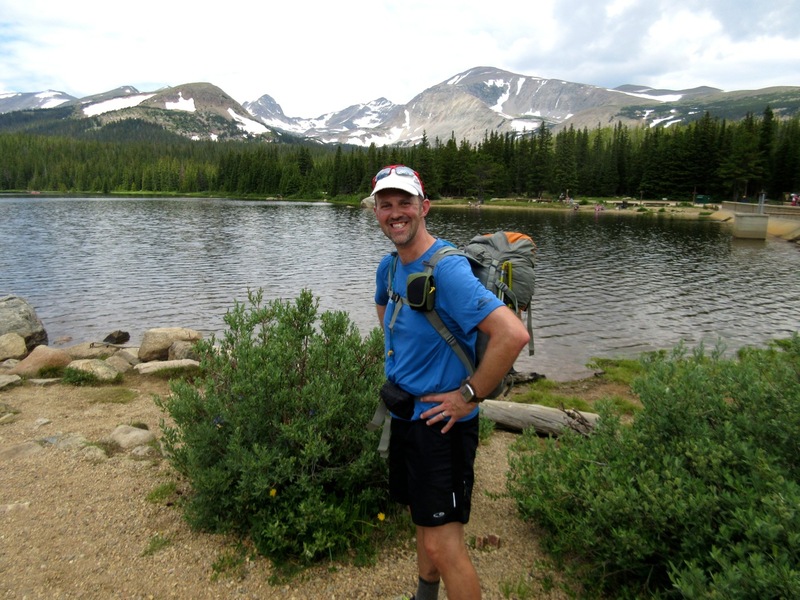 Back in the day, I used to do quite a bit of backpacking, mostly back east on the Appalachian Trail, but some out here in the Mountain West as well. Every now and then I’d see some fast, lighly-loaded guy come through, grab a handful of gorp for dinner, and head off into the night for another ten miles before bed. It turns out I can cut a lot of weight from my kit and enable some long mountain runs without too much effort and only moderate changes in what I consider running (from one side) and backpacking (from the other). The UL crowd obsesses about weight and everything is exhaustively stressed about to the nearest gram on a flourishing set of internet fora and specialized retail sites. Fabrics and materials are as space-age as they get (someone actually makes an aerogel sleeping pad) and with the price tags you’d expect for a high-tech, niche hobby. I dutifully grabbed my kitchen scale and assembled a “weightabase” of how much various gear weighs. It was fascinating. It turns out I’m a terrible judge of how much things weigh, or even whether item A is heavier than item B or not. There were various surprises; like my lightest leg coverings were actually my polarfleece extreme-conditions running tights, not my capilene long johns or even thinner running tights. However, I also realized that my needs were a little different than the usual UL backpacking crowd. Many how-to books focus purely on weight reduction with the idea that, over a ten day trip in the wilderness, every ounce counts. I don’t have the time or inclination for anything longer than a long weekend (if that), but I’ll also be running at least part of the time. Fitting everything into a fairly small pack which doesn’t jostle around is one of my requirements. Bulk is nearly as important as weight. So I’ve set out to see what is the minimum gear I need to spend a few nights in some amazing place in the mountains; to catch moonlight on the rocky crags and see dawn’s first light by alpine lakes. I already carry a fair amount of gear on my mountain runs from extra layers of clothing to some limited emergency supplies, but there are a few more things that I need to lug along. I’m sure this will be an ongoing process, but for now here’s what I’ve done. I generally rely on constant movement to keep warm but when you stop moving, you start getting cold. 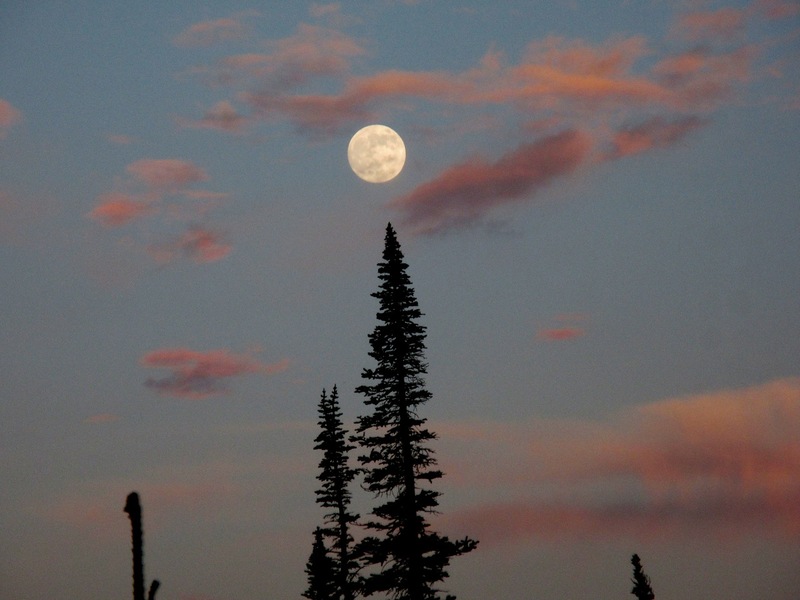 Even in the summer in Colorado’s high country, night-time temperatures can get down close to freezing, so the first priority is to bring insulation. Tapping the extensive knowledge of the UL backpacking crowd, I settled on a homemade quilt along with a lightweight down jacket from MyTrailCo (the resurrected post-bankruptcy GoLite, flagship of semi-mainstream UL gear). The rationale is that insulation works when it is all puffed up and the bottom half of a sleeping bag, the part crushed down to nothing under your massive corpus, isn’t doing anything insulative. So why carry it? Three layers of quilt ready to sew together. Harder than it sounds! Nearing completion showing the M50MR outer layer (green) and M50L liner (black). Following various patterns on-line and in books, I set out to build a quilt. It’s a layer of synthetic insulation sandwiched between a nylon liner and shell materials. After more research, I decided to go all-in on lightweight materials and bought the most state-of-the-art materials available at the moment. The insulation is an inch of ClimaShield Apex (5 oz per square yard) and the shell and liner fabrics are Momentum M50MR and M50L, respectively (0.5 oz/yd2 each). The Momentum especially is downright spooky to work with as it feels like someone peeled a layer of paint off a mirror. It looks gossamer and flimsy but it’s actually pretty strong. Sewing it is not bad as long as you’re careful not to get multiple layers sewn together. The dimensions are 80″ long by about 50″ at the shoulders tapering to 36″ at the feet. The bottom 24″ is sewn together under my legs and the bottom is sewn across to create a foot box. The back is open; I’ll rely on sleeping mat for that insulation. The finished quilt weighs in at 20 ounces which is less than half the weight of my comparable sleeping bag. Ideally, I would just sack out under the stars (the top layer of the quilt is actually DWR-finished, so it should be okay in a brief, light drizzle, in principle), but it would be distinctly unfun to spend a blustery night hunkered in a tree well under my minimal raincoat. The solution is pretty easy. I come from a long line of tarp-pitching virtuosos, so a small tarp is dandy protection in the case of bad weather. This project turned out to be quite easy and cheap and only took a couple of hours with the sewing machine. I sewed a 5’x8’ flat tarp out of some silnylon (which is about $6/yd) and it weighs in at about 7 ounces. 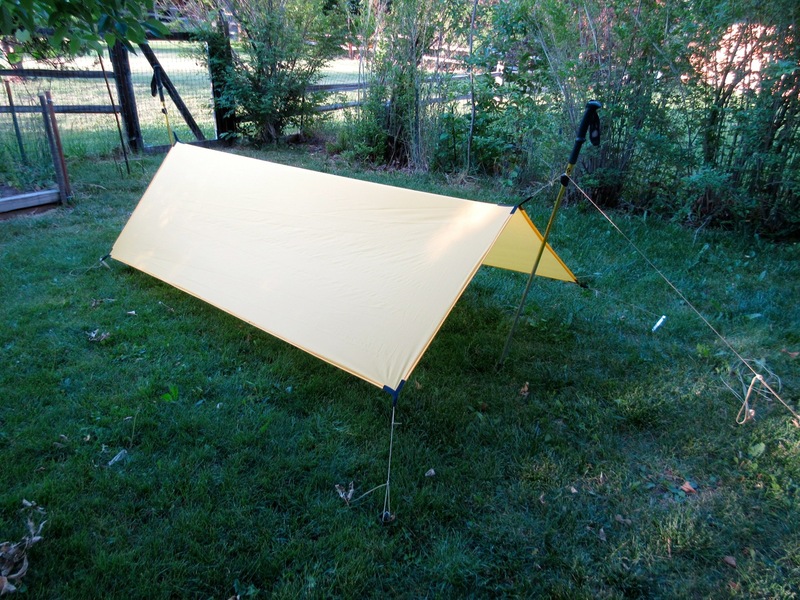 Add another couple ounces for guylines and stakes and you’ve got a versatile shelter for about 15% of what a traditional lightweight backpacking tent would weigh. No problem. 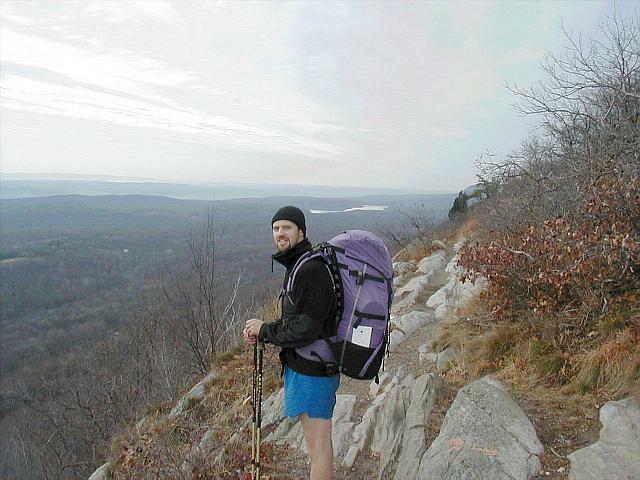 Hiking poles (which I carry anyway) are used for the main ridgeline support. You could also tie to poles or trees if you live in a place that has those things. The first UL people I encountered back in the late ‘90s eschewed the stove and pots and whatnot and subsisted entirely on cold food (as I normally do on day trips). But not starting the (chilly) morning with a hot drink, and not finishing the day with some sort of hot meal just isn’t too appealing to me. 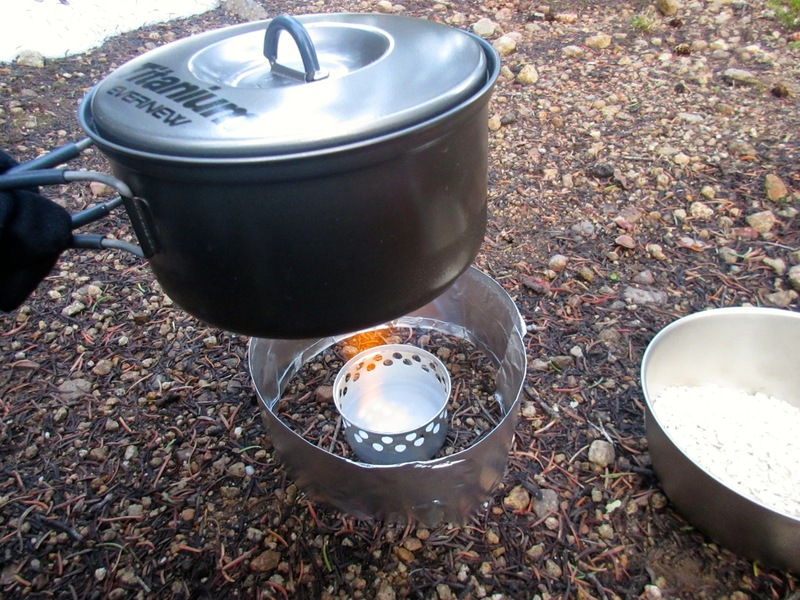 Besides, a minimalist cooking system is pretty easy and tiny compared to the warm stuff of bag and jacket. I constructed a “fancy feast” alcohol stove out of a cat food can and a hole punch. On Andy Skurka’s advice, I made a wind-screen out of a doubly-folded sheet of aluminum foil which stores nicely inside the pot (works beautifully). Initial tests show that it can boil a pint of water in eight minutes with a very modest amount of fuel (about half an ounce). Fancy feast stove doing its thing. Before I embark on bigger trips, it’s prudent to smoke-test the gear while not too far from home. All this home-made stuff seems cool, but there were certain questions. Am I going to freeze to death during a typical alpine night? Can this crazy-basic stove actually cook a satisfying meal? Can I fit everything in a pack and run with it comfortably? Will I look like an utter dork? I picked an old 30 liter cragging pack, stripped off most of the bells and whistles, pulled out the frame-sheet, and tried stuffing my gear in there. Mostly it fit, but I had to swap out the super-light RidgeRest (9 oz) for a heavier but much smaller air mattress (Big Agnes shorty, 16 oz). Adding two meals worth of food and some other things was okay, but it was still a snug fit. It tipped the scales at a respectable 12 pounds (plus food/water). UL ubergeeks can get a week-long pack down to half this weight with sufficient outlay of funds and maker-fu, but it was a pretty good place to start. From the running aspect, it was pretty stable as well bouncing down the trail in my usual mountain trail hustle (sort of running, sort of hiking). Time to test this whole concept out. I happened to be up in the mountains with some friends one Friday night, so what better time than to test my gear? After bidding adieu to my friends around midnight on Friday, I headed up the trail a mile or two in search of something flat and not too boggy to pitch camp. In this case, it meant pulling out the bag and pitching it on the ground, then collapsing therein at 1:30 in the morning. I was too tired to deploy the tarp, plus there didn’t seem to be a need. I slept soundly for about four hours before waking up and staggering around “camp” trying to warm up a bit. Survived the night. Good enough for a first test. Temperatures got down to the mid-30s and I was a bit chilly towards the end, even with all my layers on. A drawstring on the head end of the quilt would help, but mostly I felt I was losing heat through convection in the air mattress. I’ll need to try something more insulative there, even if it’s bulkier. The stove worked brilliantly! A test at home showed that it will boil a pint of water in 8 minutes (including about 2 minutes before it really starts going) and uses about 0.5 ounces of fuel in the process. Once the stove starts, it’s eerily quiet and the flames are almost invisible in the sunlight. It’s possible to blow it out, but cooking efficiently will require getting to know how much fuel I need for different conditions. The pack worked pretty well too, though I need a “system” of what goes where. Finding things often involved a pack-splosion at the side of the trail. Compartmentalizing things in stuff sacks would be handy, especially small items. Running with the pack was actually quite easy! It moves around more than my usual running pack, but it’s also much larger and heavier. I managed to hustle along (on the downhill at least) pretty well. So, in general, it’s a success but needs some tweaking. A more modern approach to backpacking. About 12 pounds, not including food and water. I hope to take my first real overnight run in the next few weeks. There’s an area on the map northwest of Buchanan Pass which has always intrigued me and it would be hard to get there and back in a day and still have time for proper exploration. The longer-term goal is a traverse of my beloved Gore Range. It might happen this year, and it might be possible in a hard 2-3 night push. Stay tuned! 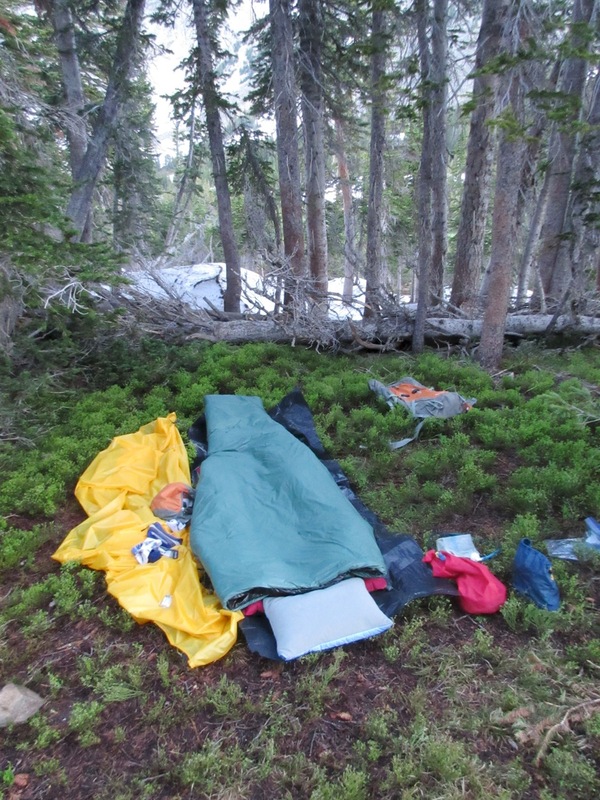 This entry was posted in backpacking, exploration and tagged backpacking, fancy feast stove, idiocy, momentum, overnight, quilt, tarp, trail running, ultralight. Bookmark the permalink. Sounds enjoyable, but watch the knees. At some point you will find that your cartilage can no longer repair itself. If that happens options are limited. I’ve been lucky so far (in my mid-40s) with pretty good knees. This shouldn’t be any worse than my usual ultrarunning adventures. At the moment, my complaint is my ankles.